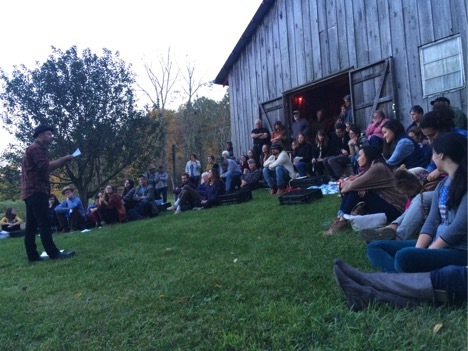 On a glorious October Saturday recently, a group of unusual people gathered at our farm. Seven of them were poets, or at least the day’s official designees of the title Poet, and about 93 of them constituted the audience. A few of them were The Band, and a good dozen were children under ten, conscripted but relishing their numbers. We met in our barn in rural Greene County, Indiana, where tools of digging and chopping and gathering line the walls and the sheds are full of the drying harvest—flowers, broom corn, colorful grinding corn, garlic, winter squash, pumpkins. The bounty on this day, though, was a community gathered around the creative spoken word. A flatbed wagon filled with food and drinks, and the poets took their places out back, at the opening to the field. This was an unusual gathering. One person had politely declined my invitation saying, the Goddess did not give him a love of poetry. And indeed, although the popular consciousness is now so much interested in invention and disruption, very little of it has much to do with poetry. Still, the crowd gathered to enact the performance of poetry—the communion of words and worlds that requires both a telling and a hearing, bodies and hearts. The poems, like the news-sharing before and after, were beautiful but sometimes chosen to shock, and they did not always tell about beautiful things. But they were always powerful: judgmental neighbors with astroturf aesthetics, fathers who rarely spoke, achievements that become little more than dreams in the rearview mirror, children, lost children, “loss button” mothers, gardens, bees, fruits, and foods. The poetry was by academic poets—Ross Gay, Catherine Bowman, Alessandra Lynch, Chris Mattingly, David Watters, Wendy Spacek, Sue Cho. They are employed to write in ivory towers, but they are poets you bump into out in the world—at the community orchard, at the farmers’ market, in the New Yorker, engraved in public art, on the baseball field. This time we met them outside of the usual poetry spaces of lecture halls, classrooms, art galleries, and front rooms. Out in the open air, night rapidly falling so that Alessandra had to borrow a light-up hat from a spelunker in the audience to finish her sequence, we sometimes had to strain to hear over the jubilant pack of children, the car wheels on the gravel road, the bugs, and evening birds. It was a cold night but a warm medium. We shared homemade vegetable juice, bean dip, lemon squares, and much more. The audience sat on crates used to ship bareroot plants in the spring. It felt like the poetry itself was planted, in a new place among a new community made up of farmers, school teachers, artists, writers, grandmothers, gardeners, sewers, bakers, students, docents, carpenters, dumpster divers, coffee slingers, small business owners, homemakers, guitar players and drummers, critics and comrades. It felt like we all made a thing that we could harvest and taste, bring to a potluck. The performance was a collective affair as we expected. But we did not know quite how we would circle around the poets on our crates. Or that children would be drawn to the speakers, going up to hold their hands and sit in their laps and carry their poems off. We did not know that we would lose the light to read, as we did, or find it again in the Milky Way. Jennifer Meta Robinson, Professor of Practice in the Anthropology Department at Indiana University, has worked on ethnographies of the local food movement for a decade, focusing on sense of place, identity, and community. She lives with her husband J.A. Hartenfeld, a 35-year farmer, in Greene County, Indiana.